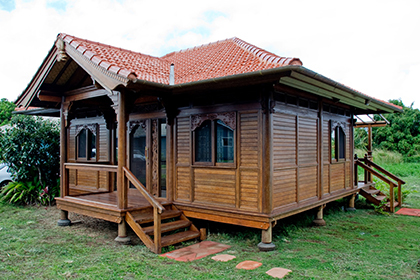 For 14 years, our specialty has been Tiny Houses and Cottages delivered worldwide as pre-built, prefabricate kit homes. 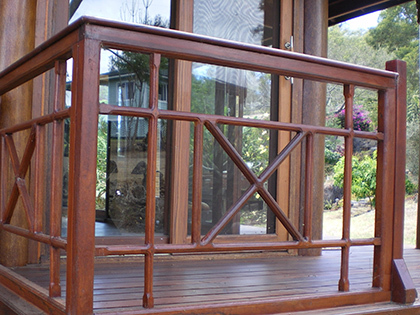 Custom designs are our specialty. 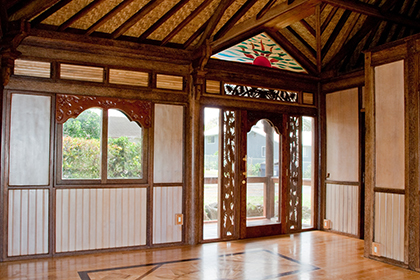 Shipped directly from Bali to your site as a panelized kit in a container, our homes are as easy to assemble as a house can get. 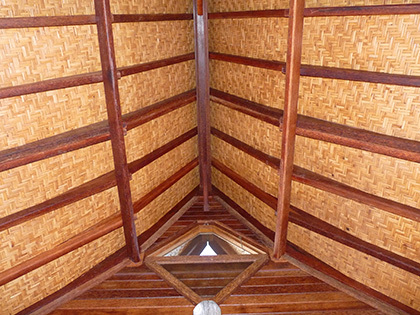 We can custom build any design and tailor it to your eco home needs. Contact us to see how we can help you. And please do look at our existing designs for inspiration. 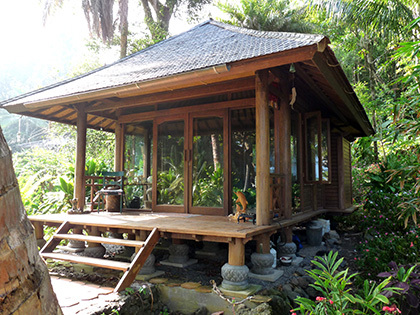 The Haiku Ohana is a 500 sq ft One Bedroom Tiny Temple Eco Home complete with a bathroom, combined living room and kitchen space. A 200 sq ft covered back deck is protected from rain by a clear polycarbonate roof. 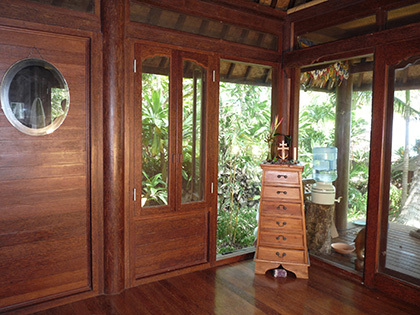 The bedroom features ultra elegant sliding double shoji doors with frosted glass panels. The doors separate the bedroom from the living room for provided privacy, while the ceiling is open between rooms to feel the full expanse of the vaulted ceiling.The living room also features an integrated glass skylight. The full bathroom is equipped with a flat ceiling which doubles as a hidden storage space. And the front entrance opens to a mini deck with a beautiful dormer roof, adding to the grace and beauty of the entire home. 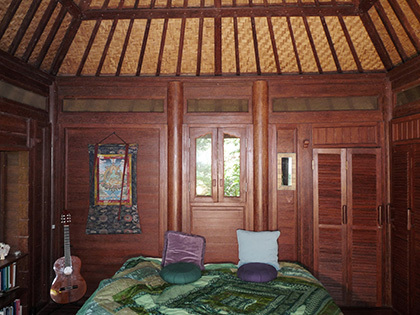 This design is one of the most efficient uses of space for a 500 sq ft cottage featuring the full Balinese aesthetic. 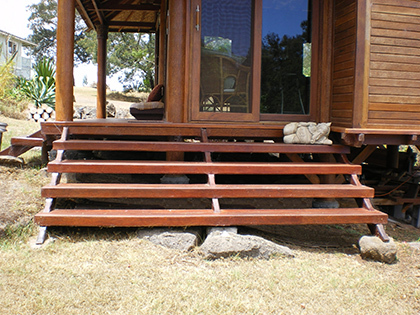 600 sq ft (56 sq m), 20ft x 30ft (6.1m x 9.2m) plus 240 sq ft (22 sq m) of covered decks. 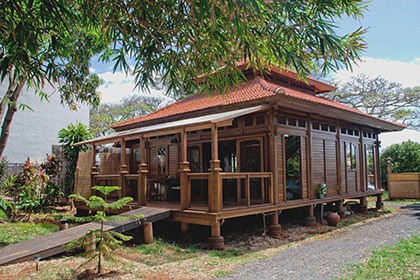 Our Paia Ohana is a beautiful, open studio inspired by Balinese temple design. Featuring a magnificent cupola roof, which welcomes an overhead element of natural light and ventilation, our floor to ceiling glass paneled walls give this home a natural, open, feeling. 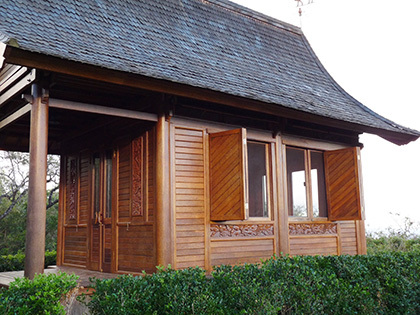 Ornate pillars featuring Balinese Temple carvings throughout. A small bathroom extension with its own roof keeps the main room open and unobstructed. 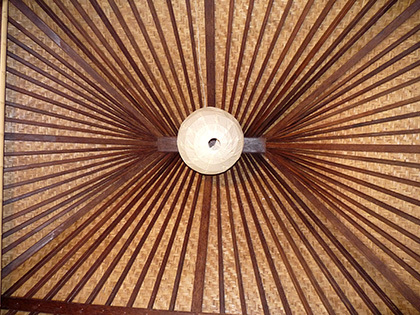 And the flooring is laid in a concentric patten with an exotic central motif. 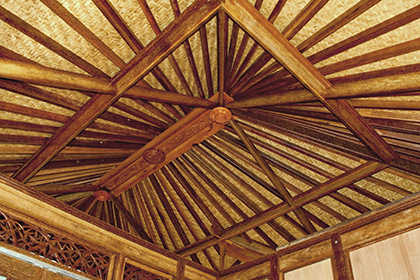 Two luxurious decks, which allow for maximum exposure to the outdoors, while still providing protection from the elements, complete this living space. 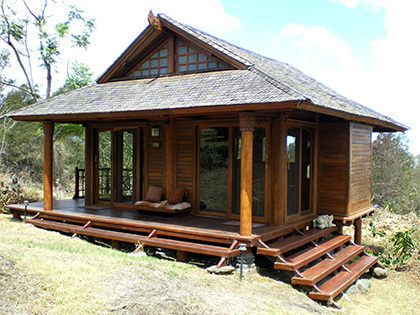 The Kula Cottage is a blend of styles which features a single roof which covers the main room and decks. 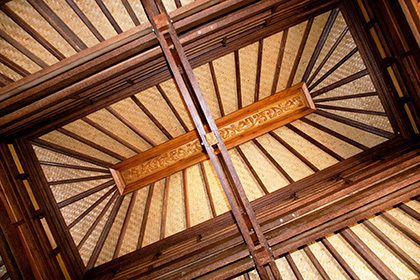 The central wood beam beautifully flairs beyond the structure, traditional of Balinese architecture. 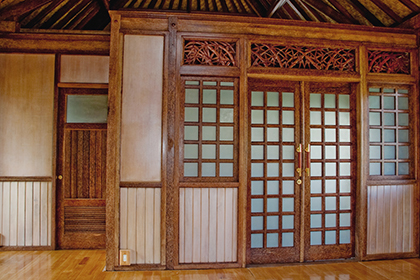 Closets are added as an extension to the main room,to keep the main room comfortably open, yet still placed congruently under the roof eaves. 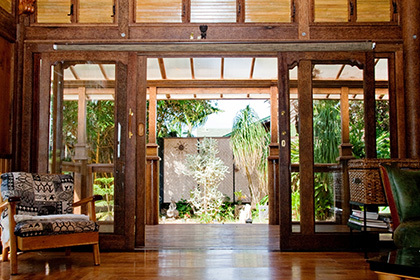 The extra wide entrance stairs add an element of grandeur to this tiny home. 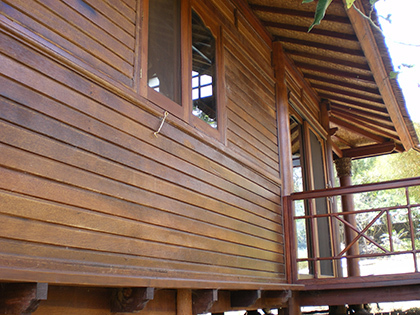 The Kaupo Cottage is a truly unique tiny home, featuring a distinctly elegant, curved ironwood roof. A vaulted ceiling loft covers half the main room, nearly doubling your total living area. 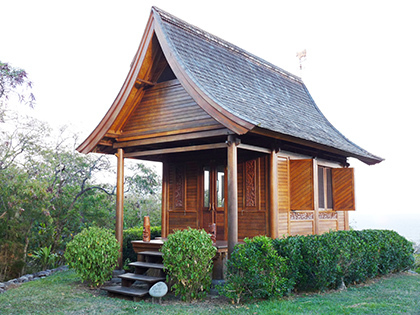 And this tiny home is complete with solid shutters and screened windows which fully open to the view by day and can be sealed and locked in the evening for security. 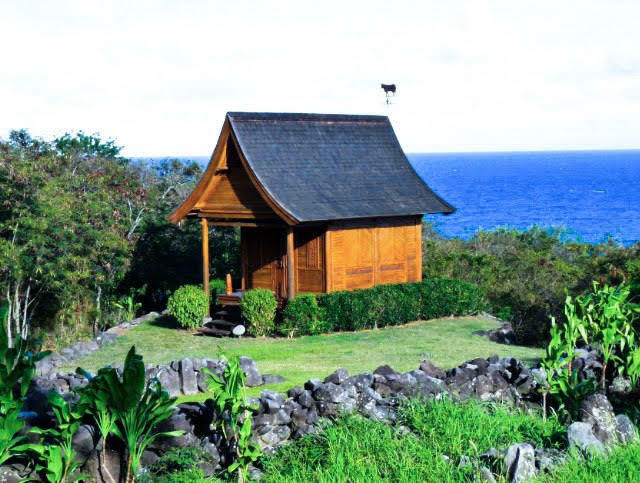 The Kipahulu Cottage was created with the ocean view in mind. The Kipahulu Ohana beautifully features side and front walls made of glass, offering 180 degree panoramic views from the comfort of your home! Two closets are built out from the main room as extensions, leaving more space for you to enjoy the views of your natural environment. 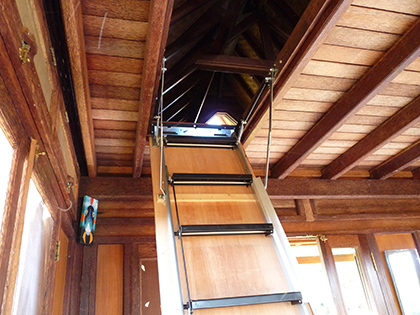 And the ceiling covering the deck conveniently doubles as a loft space. 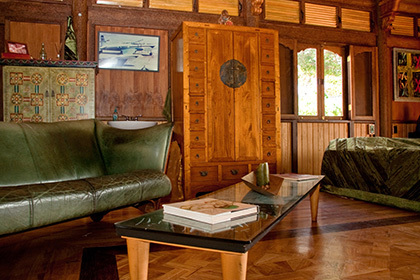 This is jungle living at its finest!